Both are bullish. The consolidation path will help with a better foundation. There will be a psychological resistance at $4.00, so when we pass that level we want to do it on big volume. What we want to see next week is a hold of the $3.70's at the low end and a test of the $3.90 at the high end. We want to see upward moves happen on volume higher than 50 million shares. We want to see downward moves happen on 40 million shares or less. This type of action will point toward consolidation and will help build support. My biggest issue with the recent trends is that we lack any real strength in support levels. 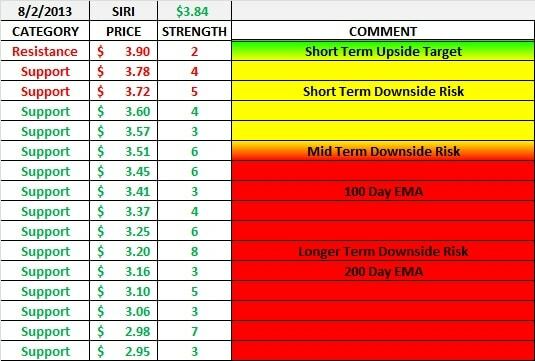 Moderate support below is still all the way down to $3.50. That leaves a lot of room for the equity to be sensitive to macro-economic conditions. As an investor, this is good to know. If the overall markets get sour, SiriusXM will react in tandem if there is no equity specific news to stop it. The EMA's are all bullish. They still have not had a chance to compress very much. In my opinion the maximum stretch we can see on the PPS is about $4.00. After that I see a retracement. Bear in mind that a macro-economic event could turn us to a correction at any point. A savvy trader will catch this somewhere near the top, await the retracement and then get back in.